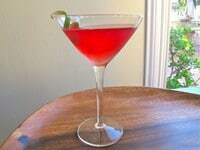 Classic cranberry cosmopolitan martini made with kosher mixers. This sophisticated cosmo martini is always a crowd pleaser. Testing cocktails for Purim today and came across this. It’s perfect! Thanks for the kosher liquor recs too.